Ingredients: Durum wheat semolina, water, salt. Description: Malloreddus, known as “Sardinian gnocchetti”, is the typical pasta of Sardinia's cuisine. They have the shape of small striped shells, about 2 cm long and are prepared with semolina flour and water. 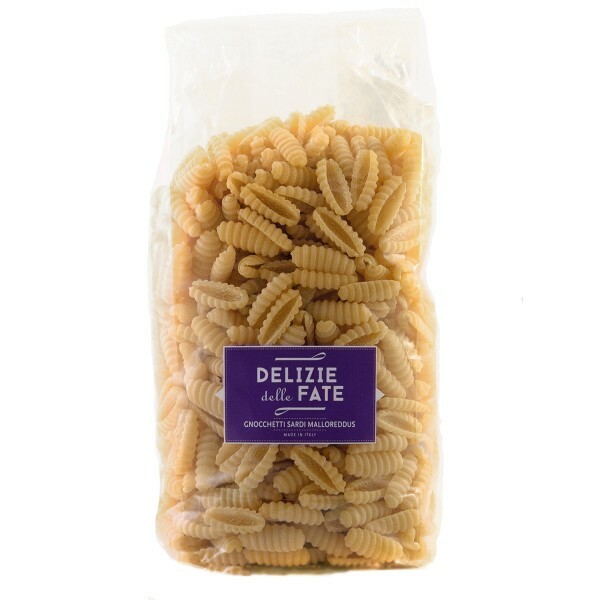 The term "malloreddus" in Sardinia means vitellini: In the farmer's imagination, the small and slightly pungent form of this pasta, assumed the shape of small calves. You can taste them with various sauces: sausage sauce (Malloreddus alla campidanese), pork and mushrooms sauce (Malloreddus alla barbaricina) or fish sauce. Conservation: Store in a cool, dry place after opening.